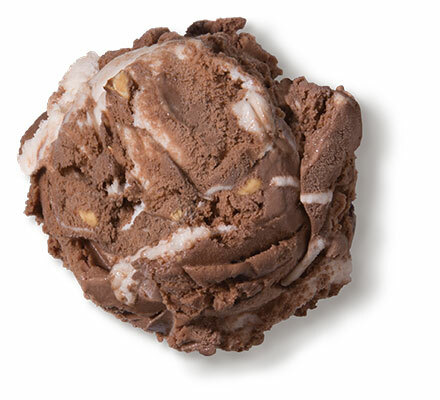 Creamy marshmallow ribbon and crunchy mixed nuts blended in chocolate ice cream. Ingredients: Milk, Cream, Marshmallow Ribbon (Water, Corn Syrup, Sugar, Whey Protein Concentrate, Gelatin, Sodium Hexametaphosphate, Cellulose Gel, Sodium Aluminum Phosphate, Cellulose Gum), Skim Milk, Sugar, Buttermilk, Mixed Nuts (Almonds, Cashews, Canola Oil, Salt), Corn Syrup, Cocoa Processed With Alkali, Contains 1% or less of Mono & Diglycerides, Carob Bean Gum, Tara Gum, Guar Gum, Cellulose Gel, Cellulose Gum, Carrageenan, Red 40, Yellow 5, Blue 1. Allergen Information: Contains Almonds, Cashews, Milk.